Natural star Nani carved a niche for himself and many good things are happening at a time for Nani. He is currently going through a dream phase in his entire career. He started 2017 with a bang in the form of a grand success with Nenu Local, who is rejoicing in the success of his latest release Nenu Local, a Trinadha Rao Nakkina’s directorial, has already started shooting for his next film. It is directed by debutant filmmaker Shiva and D.V.V. Danayya will be producing the film under VV Entertainment banner. He has now got three films in his kitty. 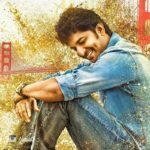 Currently, he is busy wrapping up debutante Shiva Nirvana’s Ninnu Kori which is being filmed in abroad. The shoot will be wrapped up by mid-summer. Malayali Beauty Gentleman fame Nivetha Thomas is playing the female lead and Sarrainodu villain Aadhi Pinisetty will be seen in an important role. The film hits the screens in summer. So this way we can expect to see another entertainment pack film from Nani. In the meantime, he has green signaled another film titled MCA in Dil Raju’s production. Venu Sriram will direct this fun filled entertainer which will commence its shoot in April end. After these two films, Nani will join hands with Hanu Raghavapudi for an interesting thriller. This film will go on floors in August and likely to be wrapped up by the end of this year.